Wars have also been fought with pencils and talented artists. Drawing was a way to express a torrent of emotions words could not, a way to capture the war in all its horror, misery and stench. WWII was no exception. 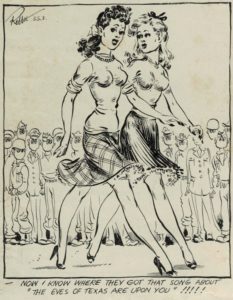 Willie and Joe, the two mud-covered, dry-humored infantrymen drawn by cartoonist Bill Mauldin are the most famous example of humor at the foxhole level. Humor, as Mauldin pointed, is really laughing off a hurt, grinning at misery. Other talented artists-soldiers served in other combat units, including the 99th Division. He was known as “Robbie”. Robert S. Robison was born on June 22, 1915 in Curwensville, Pennsylvania. According to his classmates of the local public school, Robert was always sketching and drawing wherever he was and whatever he was doing. While in high school he decorated the windows of a local drug store with a display of cut-out football players before a big game on Thanksgiving Day. 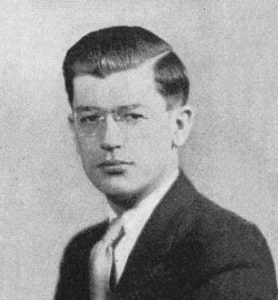 He graduated from high school on May 18, 1932, and was listed as the « Class Artist » in the year book. In September of 1932, he attended the Carnegie Institute of Technology, School of Art, in Pittsburgh, PA. While a college student he earned extra money by painting signs for several local businesses. In June 1936 he graduated with a Bachelor of Fine Arts degree. With his BFA in the pocket, he moved to New York City to pursue a career as a freelance book illustrator and commercial artist. In 1937 he drew Lance Darrow comics for the Centaur Comics Group under the pen name « Robbie. 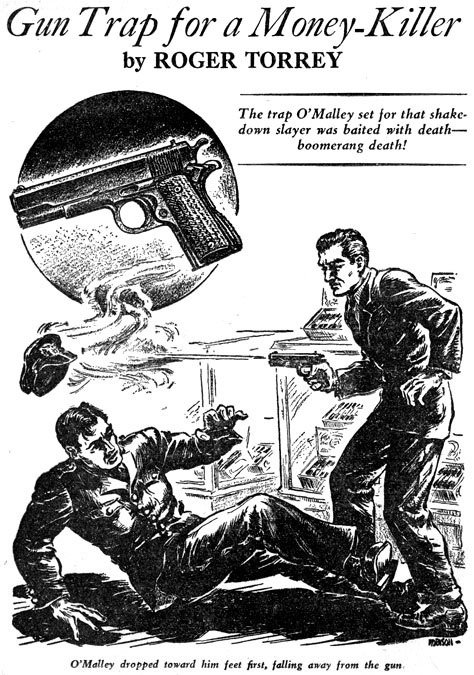 » His talent found work drawing pen and ink story illustrations for pulp magazines. His work appeared in Ace Sports, Champion Sports, Ten-Story Sports, 12 Sports Monthly, Ten Detective Aces, Private Detective, and Star Detective. Robbie Robison, as he was soon to be known by his Army mates was drafted on November 21, 1942. After boot camp, he joined the 99th Infantry Division. He was preceded by his talent and joined the division headquarters as writer and artist for the division newspaper, the “Checkerboard”. 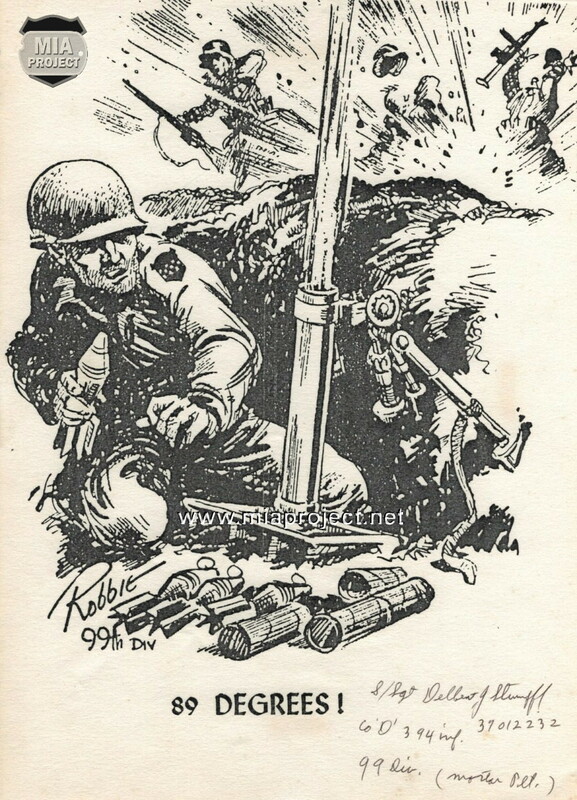 Robbie’s prolific and wonderfully imaginative work began to appear in the January 1943 issue of the division newspaper with the exploits of a hapless G.I., called Private Van Dorn. His drawings were both serious and humorous. High in significance among the former is a series called “This Is the Enemy.” Each drawing is devoted to a certain prominent leader of the Axis Powers and their allies, each person brilliantly depicted in caricature form. Accompanying the drawings are brief biographical and character sketches along with pertinent historical data. Included in this series are personages such as Japan’s Emperor Hirohito, Germany’s Propaganda Minister Joseph Goebbels, and Italy’s Premier Pietro Bagoglio. 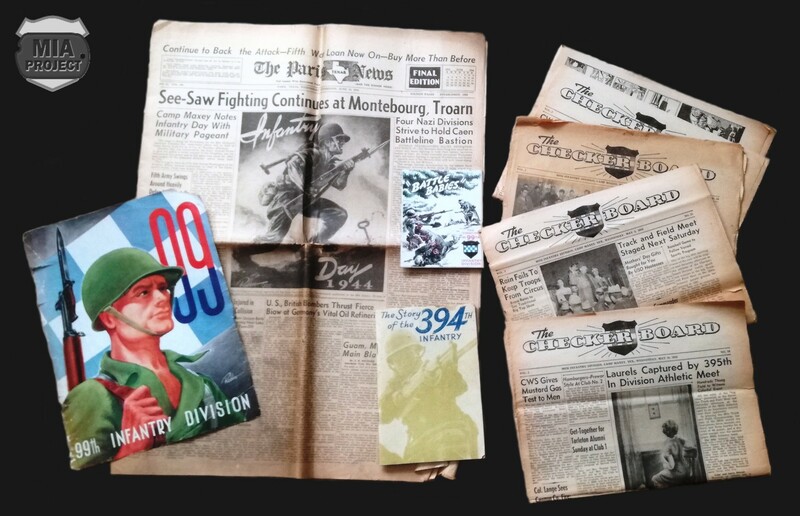 Small sample of 99th Division newspapers and magazines where Robbie’s talent was published. 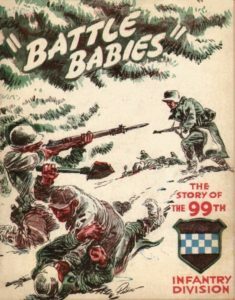 When the 99th Division first saw action during the Battle of the Bulge, and until war’s end, Robbie realized remarkable drawings that emphasized specific combat actions where soldiers of his division showed particular bravery. Famous action fought by the 1st Bn, 394th Infantry at Losheimergraben. It shows the mortars of Co D firing at 89 degrees to brake the German assault on the crossroad. Copy is autographed by mortar squad leader S/Sgt Delbert J. Stumpff. 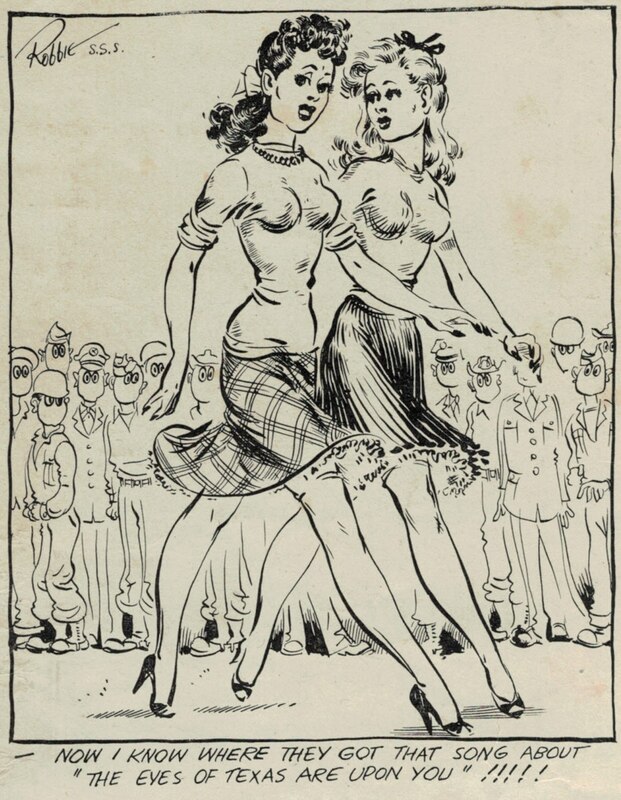 « Dolly », one of the doughboys’ favorite charachters of the Checkerboard newspaper..
Robbie didn’t forget that he was drawing for GIs who lacked feminine companionship, he also offered many morale boosters in the form of sketches of gorgeous, shapely women. He was a true master in many kinds of art work and also contributed to Yank Magazine and The Stars & Stripes. 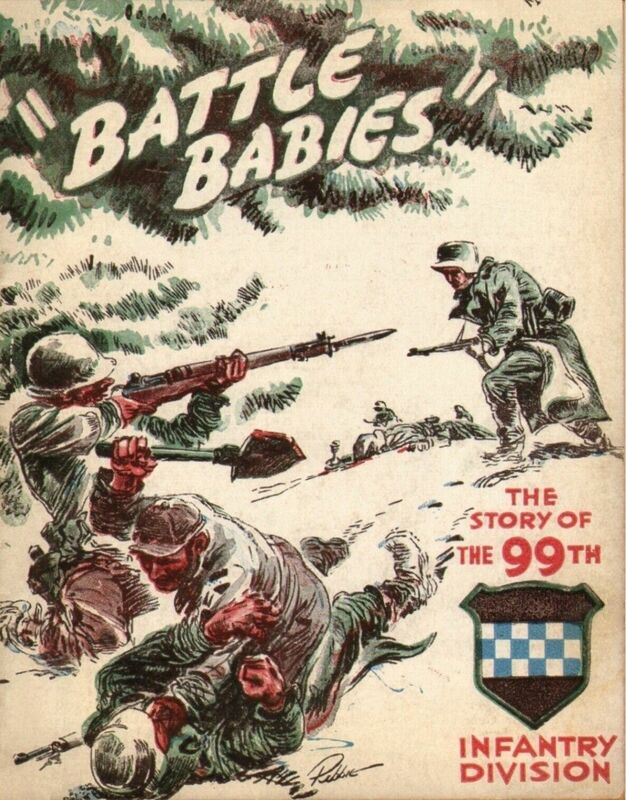 Cover of the 99th Division history booklet. After VE Day he worked for the Army Office of Public Relations in England. He returned home in September 1946. His post war career started at the CIT as art instructor where he was hired as Assistant Professor of Drawing in the School of Applied Arts at the University of Cincinnati in Ohio. Two years later, he was Chairman of the Commercial Art Department at Washington University in St. Louis, Missouri. Robbie illustrated over fifty children’s books, including The Gay Poet – Eugene Field, Piang – The Moro Chieftain, James Whitcomb Riley – Hoosier Poet, Walter Johnson – King of Pitchers, Sailor Jack & Eddy, and Little Alfie, which he wrote and illustrated. He was Art Director of the first thirty film strips on American history produced by Concordia Press. On January 23, 1958 he was elected President of the St. Louis Art Director’s Club. He was again elected President ten years later, which made him the only person ever elected to the position twice. 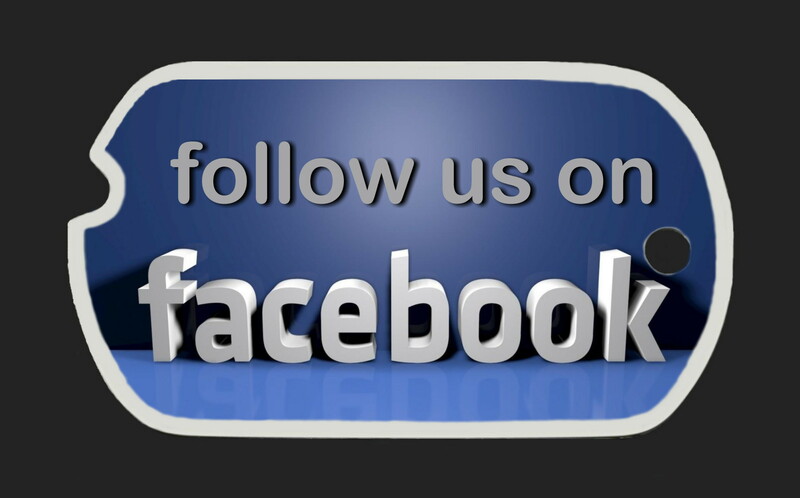 In 1962 he was a delegate member of Icograda, the International Congress of Graphic Design Associations. Robert Shearer Robison died in St. John’s Hospital in St. Louis at age of fifty-five on November 27, 1970.